7 Days (6 Nights) Uganda safari combines adventure primate tracking with game viewing in 3 of Uganda’s top parks. Highlights of the trip include gorilla trekking, game drive and boat cruise on Kazinga Channel. Different airlines land at various time intervals at the airport, some come in early morning and others afternoon, evening and late night. Whatever flight that you and comfortable with as long as it heads to Uganda, our company representative will be waiting on you. Transfer to your lodge after airport pickup. Your 7 days safari in Uganda has started today, you are welcome. 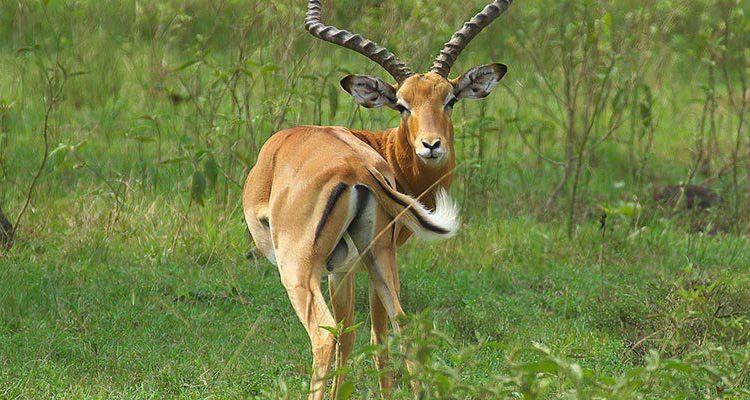 Kibale forest National Park is among the top and most interesting parks to visit while in Uganda. the park is a home to over 70 mammals with the largest population of chimpanzees in Uganda. other animals include forest hogs, monkey sub-species, over 376 bird species and up to 351 tree species. The drive from Kampala to Kibale forest via Mubende town is approximately 6 to 7hrs. Enjoy an interesting drive all the way, peel your eyes there is so much to see. On this day , there are all interesting activities on the menu, the game drives offers great chances to see thousands of elephants, buffaloes, lions, hyena, leopard, bushbuck, Uganda kob, warthogs and this is best done in the early morning and late evening. The launch cruise makes a great desitnation to the Kazinga channel, at the channel you can view many hippos lazily swimming in the waters, young men jumping down from the metal poles of the channel, beautiful birds of Queen Elizabeth. After the day’s activities, return your lodge for dinner and overnight stay. Bwindi forest National Park is prestigiously described as the ultimate gorilla experience, reason being, that it is only place in Africa where you will meet the ultimate gorilla trekking experience on a wildlife safari. The drive from Queen Elizabeth to Bwindi National parks offers a great highlight of the Ishasha sector beautiful zone for the tree climbing lions. Proceed to the park for dinner and overnight stay. This is the highlight of the Uganda safari, an up-close encounter with the gorillas is such an amaziong and memorable experience. After an early breakfast, you will be transfered to the park ranger headquaters for briefing and last minute preparations. Head into the forest under guidance of UWA officials , you will have to pack lunch and bottled water as it the trek may take long hours before you meet the gorillas. You will be given an hour in their midst to take pictures and observe them feeding and interacting. Trek to extraction point where our driver will transfer you back to the lodge. In the evening , you can go and visit the Batwa pygmies.